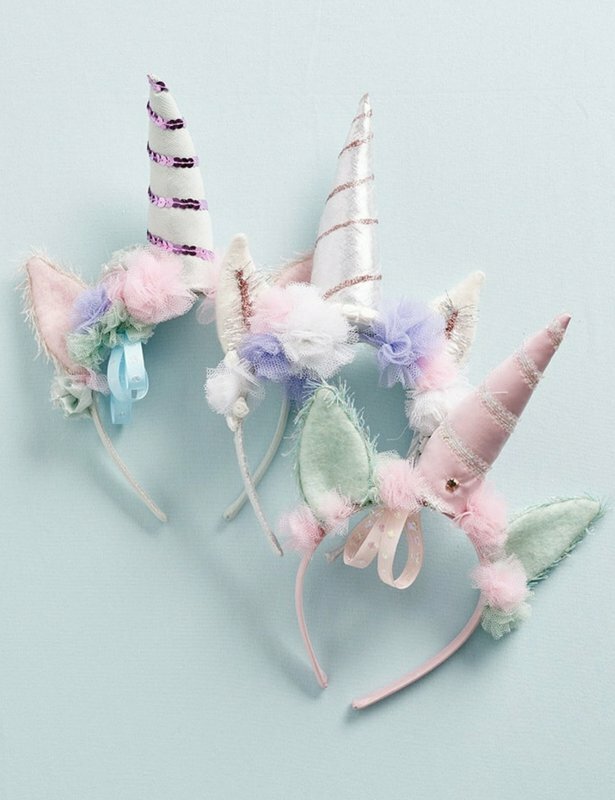 Unicorn headbands are a rage at parties and carnivals. 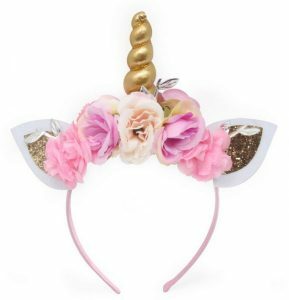 The floral unicorn headbands suit women as well as younger children. 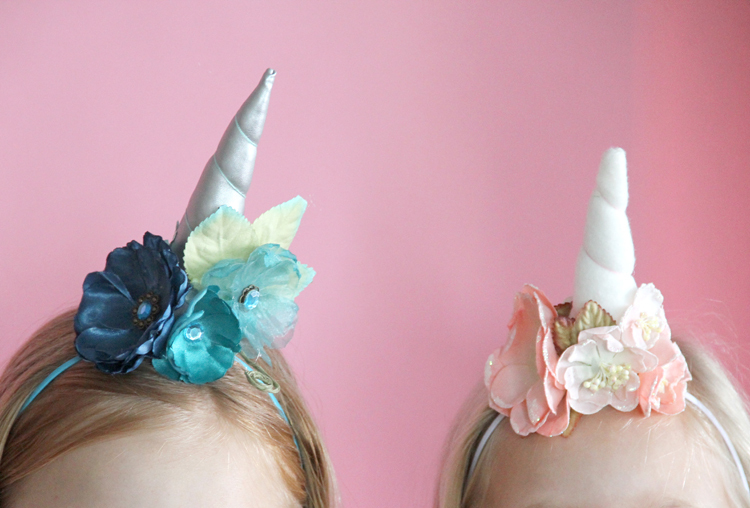 The large horn is the highlight of the DIY headbands. 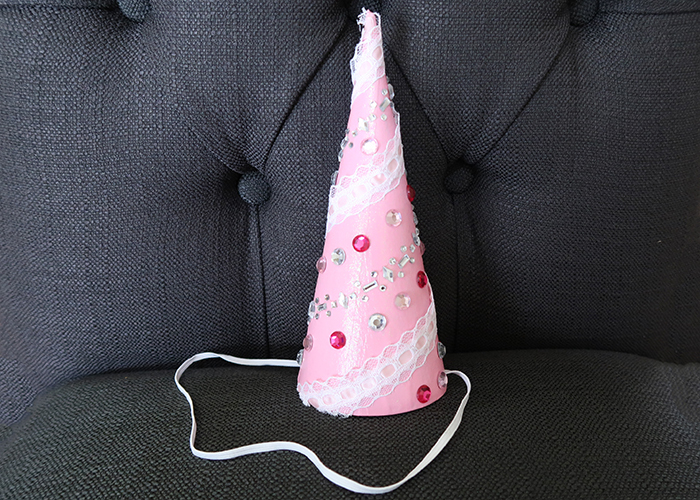 That makes it a glamorous addition to any celebration. However, if you want to be more discreet, you can cover the headbands with flowers or plush designs. 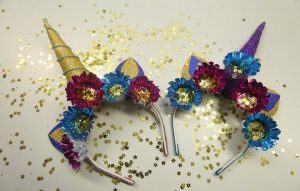 You need to first transfer the horn and ears templates to glitter foam sheets and cut them out. Then make the horn by rolling the sheets according to the instructions. A metallic elastic thread is wrapped around the horn for enhancing its looks. You can use this gorgeous headband at photo booths of unicorn parties. It can also be used as a part of Halloween costumes and to enhance your bedroom décor. 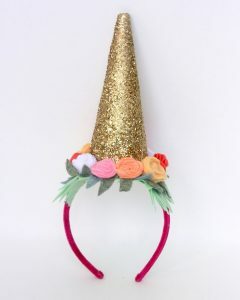 To make the horn, a cardboard cone is covered in glue, then glitter, allowed to dry and spray painted in clear gloss paint. Here, white cardstock is rolled in a cone shape and secured nicely with a hot glue gun. 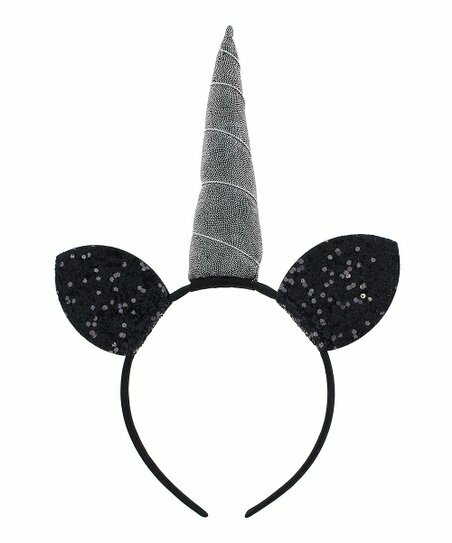 It would be the unicorn horn. You should try to make the cone tip as small as possible. 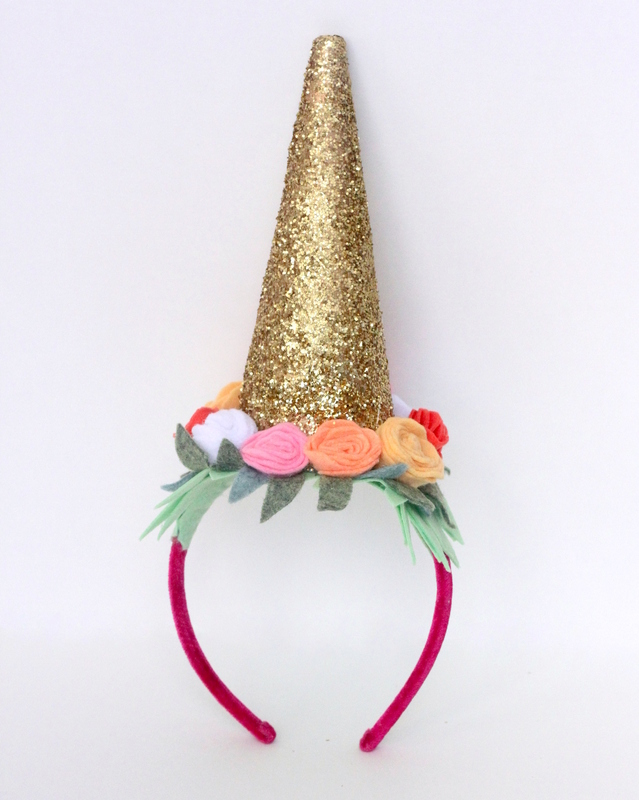 Then hot glue a ribbon, trim or gold metallic paper around the cone. You can use a green and red color scheme if you are making it for Christmas. 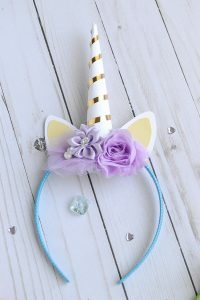 This unicorn headband is quite easy to do and can be designed in about 30 minutes. 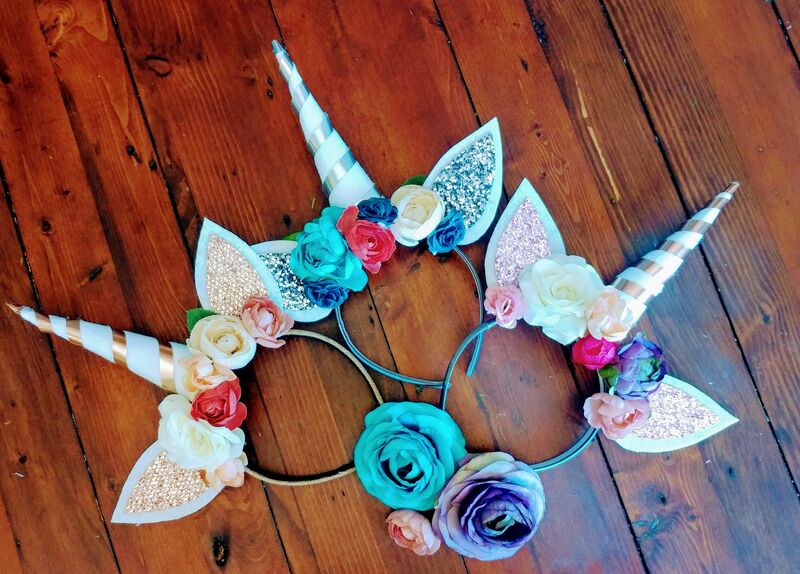 Craft flowers add to the beauty of the accessory. 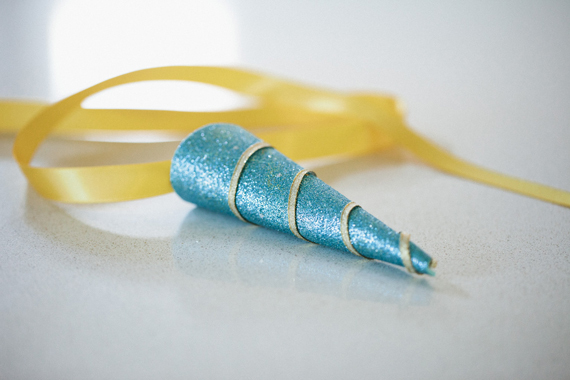 The horn is made by rolling a piece of white felt into a cone. 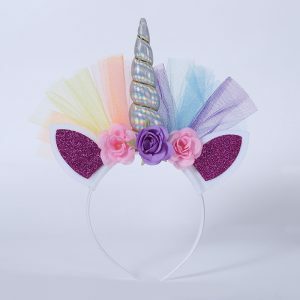 You can also decorate the headband with pieces of purple, blue, yellow, orange tulle for a rainbow unicorn horn headband. It would look great at parties. These beauties are not made with any set template. Just cut out a triangular shape out of white felt without the tip. Roll it into a cone and secure it with hot glue. A thread is wound around it for making the horn unique. 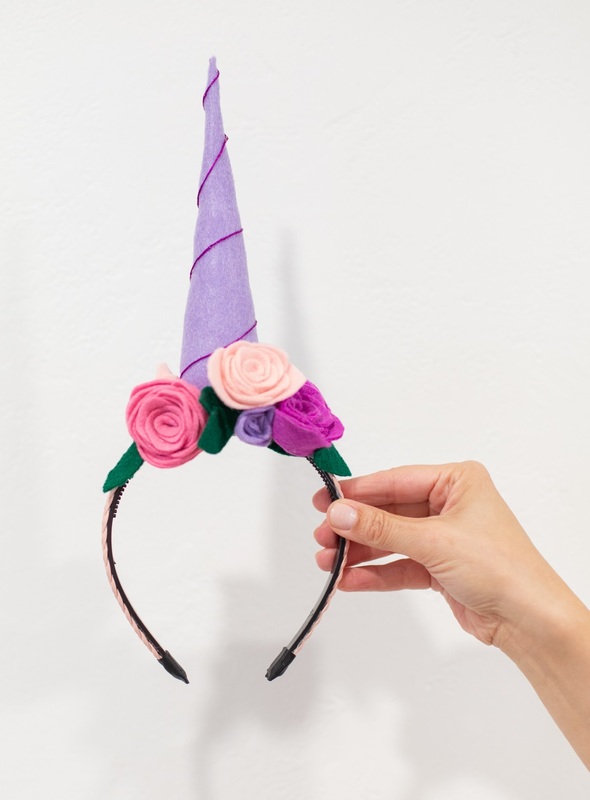 This tutorial comes with a pattern for the unicorn horn and uses an elastic band and craft flowers. Scrap fabric is cut according to the pattern, sewn along the edges and filled with polyester fiberfill. This pink headband would be adored by your little girl and she would love to wear it for her birthday. If you want, you can decorate the headband with red silk flowers instead of pink. You can cut the ears out of black felt and attach a black horn to the headband for teaming your accessory with a black outfit. Dark colors deem it fit as a Gothic headgear. 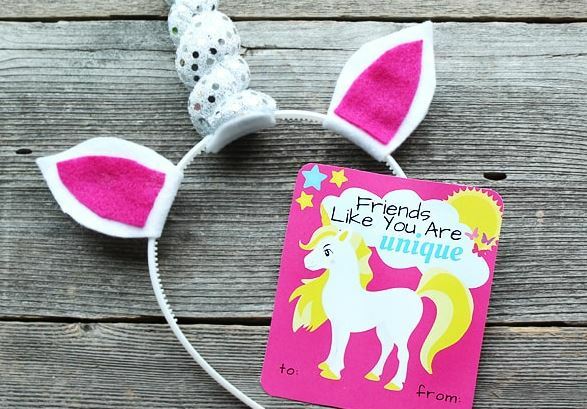 You can also make it furry by attaching artificial fur. Glow in the dark paint would make it an attention grabber at parties. Younger children like preschoolers and toddlers would love to wear this headband for pretend play. Paper flowers add to the looks. 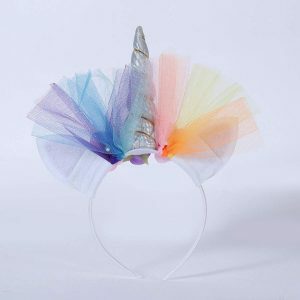 You can also decorate it with marabou feathers. Kids might like to wear this cute headband for unicorn themed parties and while playing make-believe. A plastic headband serves as the base of the DIY. 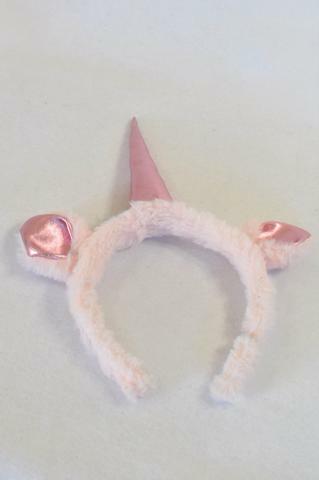 The ears are made of in two colors of felt. 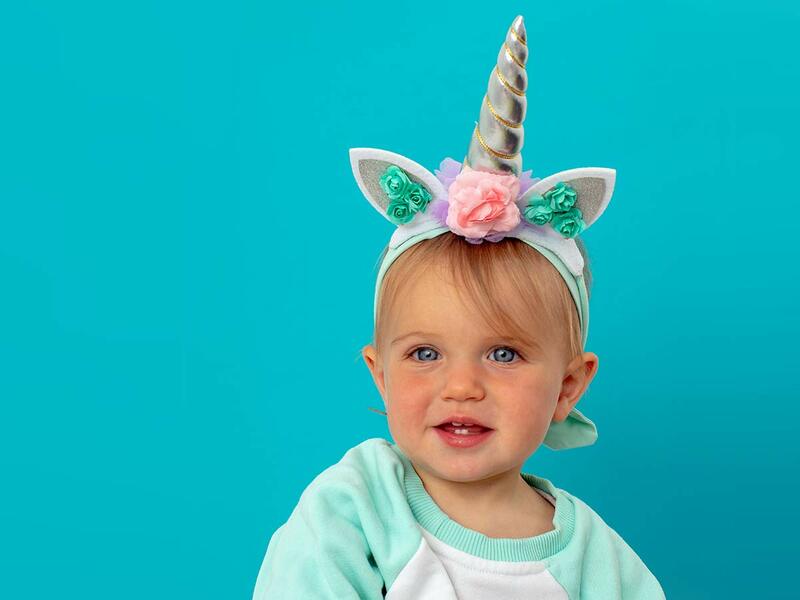 You can choose pink felt for a girl and blue for a boy. 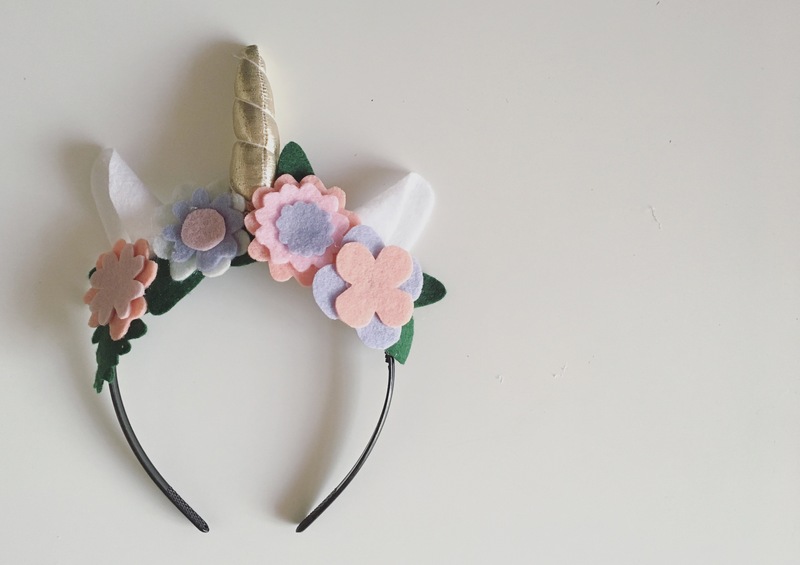 How about giving the ears a miss and decorating the headband with tulle? You can use dark or light pastel shades of the fabric that is tied to the headband for a nifty look. The horn would look good in gold, silver or a black and gold combination. 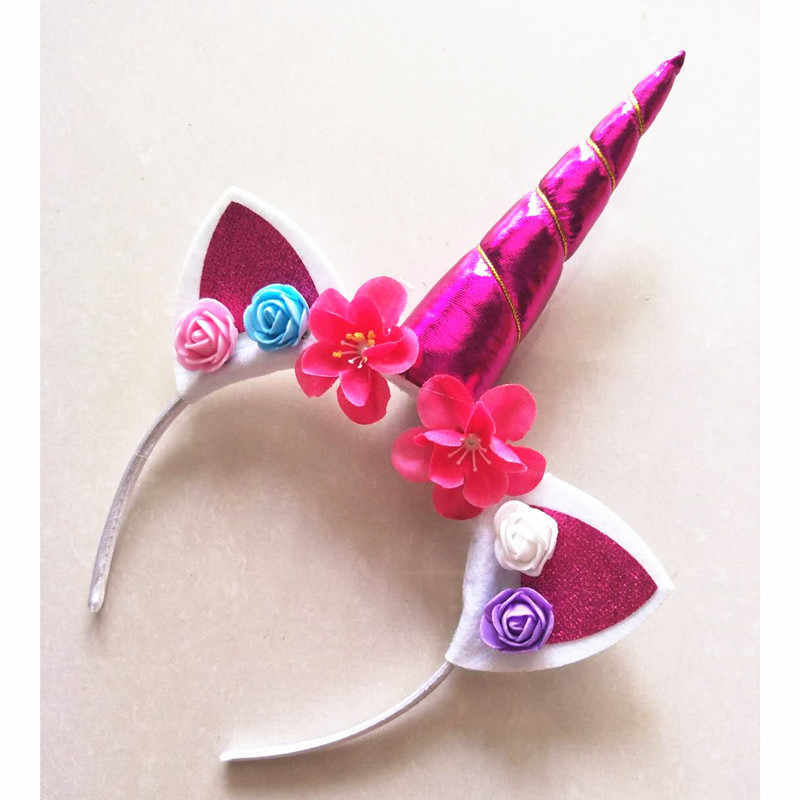 In the above-linked article, you need to scroll down to the part that speaks about making the unicorn headband. You have to take a toilet paper roll and twist it into a conical shape. It is later covered with fine golden glitter. 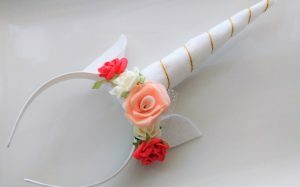 We are sure that the lovely pictures of the headbands would inspire you in the craft. 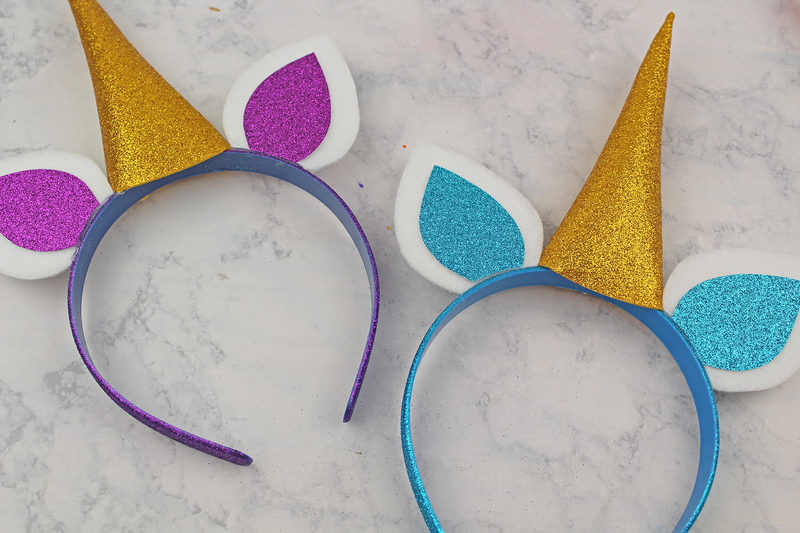 They would add a fun twist to your parties. 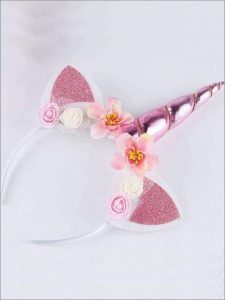 You can decorate the DIY headbands with satin ribbons, rhinestones and fabric of your choice. Do let us know how the unicorn headbands turned out.